Poodlefest 2017 - The Poodle Club of Victoria Inc.
TUESDAY 26TH SEPTEMBER, 2017: THE POODLE CLUB OF VICTORIA INC. CHAMPIONSHIP SHOW - After RAS Poodle Judging. My Mum had shown and bred Toy Poodles under her ‘Gaieval’ affix. I first began showing Toy Poodles when I was eight years old and when I was 11 my parents bought me my first Standard Poodle,I had fallen in love with the Standards watching Vicky Marshall show Ch Vicmars The Ringmaster at Darlington Ch Show,which was our local ‘big’ show.From then on I badgered my Mum and Dad to buy me a puppy from Vicky ,eventually they gave in! I went to stay with Vicky to learn how to care for my puppy and a friendship blossomed,I became part of the Vicmar family and spent most school holidays travelling to shows and helping at the kennels.When Vicky decided to retire she asked me to take over her few remaining dogs and her Affix, so at 16 years of age I became the holder of her world famous affix. Since taking over in 1979 I have owned bred or shown 25 UK Champions,including 3 ‘Gaieval’Toy Poodles.Amongst them are the Group Winning Champions:In Demand,Royale Show,Devils Disciple,Quiet Riot and Party Leader. 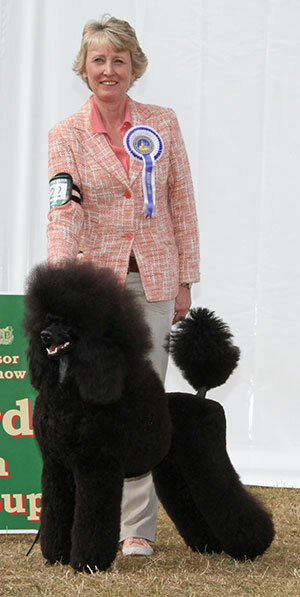 My biggest winning dog is also one of my most recent,Ch Vicmars Rave On ,has 26 CC’s and multiple Group wins and places.He was the UK’s Top Winning Poodle 2010,in 2011 he won the Utility Group at Crufts,to win at this level was a dream come true.Rave On was not heavily campaigned after this win,he did become the first dog to win Best In Show three times at The Standard Poodle Club Championship Show.Despite attending only 10 shows in 2012 he was once again the UK’s Top Standard Poodle.Theo has sired my last two Champions,Ch Vicmars Ring My Bell and Ch Vulcan Shall We Dance for Vicmar.He also has Champion Children in USA,Sweden,South Africa and Australia plus more in Sweden all on their way to being titled.His much travelled Son Am Sw Ch Huffish Rave The Rhythm,is a Group and BIS winner. I’m currently campaigning Ch Vicmars Pretty Reckless who was Top Standard Puppy in 2014,qualified for the Pro Plan/ DW Pup Of The Year, where she made the shortlist. ‘Elsie’ was Top CC winner and Joint Top Standard Poodle 2015,I was also Top Standard Breeder 2015,she gained speciality BIS and Group 2nd&3rd placements.Due to family commitments we have attended few shows in 2016 but Elsie has added to her tally of 12 CC’s,1ResCC.Although too young to retire,she will now stay at home whilst we begin to campaign our new girl from Sweden,Huffish That Woman At Vicmar,bred by Lotta Sandell,’Raven’ is another Ch Rave On daughter. Since being approved by the Kennel Club I have awarded Challenge Certificates in Standard Poodles 10 times,most notably at Crufts 2012,other appointments include The Standard Poodle Club ,British Utility Breeds and Ladies Kennel Association. I have judged Miniature Poodles with Challenge Certificates 8 times ,including Crufts 2014,Windsor and a number of Breed Clubs.I am once more judging Miniatures at Windsor in 2016,where my entry is the 2nd highest for the year,exceeded only by Crufts. I have awarded Challenge Certificates in Toy Poodles 8 times ,including Ladies Kennel Association,Northern Toy Poodle Club and West Of England Ladies Kennels Society.I have a future appointment at South Wales Kennel Association in 2016. I was also on the judging panel for The Poodle Of The Year 2013 and have judged BIS at Breed Clubs. Overseas appointments include judging several times in Sweden,Norway,Finland , Denmark,Netherlands and Germany.I also judged some utility breeds and Poodles at Green Star level in Ireland. I judged in Australia for Poodle Club of Victoria in 1990.I have judged other Utility Breeds at Open Show level but really at heart I’m a breed specialist.. I am also an approved assessor for prospective breed judges, I have acted in this capacity for both The Poodle Council and The Kennel Club Judges Development Program. I’m also proud to be the Secretary of The Poodle Club, which is believed to be the oldest Poodle Breed Club in the World, it was founded in 1876. I took over from the wonderful Norman &Miriam Butcher( Tuttlebees Poodles) who had been in charge for a remarkable 50 years.